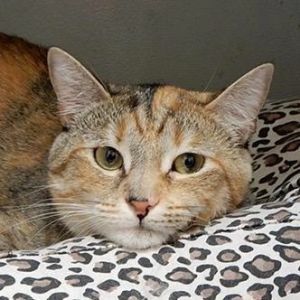 Hi, my name is LILLY and I am a one and a half year old GORGEOUS, CALICO female kitty. My fur is a PRETTY blend of orange, black and cream and I have PRETTY COPPER colored eyes. I enjoy the COMPANY OF OTHER CATS and I am very SOCIAL when I’m around them. That is why it is important that I go to a home that has another cat or kitten that I can hang around with. I tend to be a bit nervous and shy around people. That’s because I have not had a lot of contact with humans, so it might take a bit of time to earn my trust and get used to the human touch. I would most definitely thrive in a CALM household with an EXPERIENCED cat person; ideally a person who has familiarity with under socialized cats. I’m sure with patience and gentle coaxing, it won’t be long before I’m out of my shell. If you’re in the market for a good COMPANION CAT (that may never become a lap cat) consider me! I am located in Long Beach, NY. I am spayed, UTD on shots, and FIV/FeLV negative.